Hello! For those who are unfamiliar with TeamSpeak, it is a Voice IP software that allows you to communicate vocally with other people. Everyone can access different channels used to filter the theme of discussion. Our server is divided into multiple different channels, whether they are public gaming channels or private ones. The first thing you want to do is probably install the software. Click on this link to go to the Downloads page of the TeamSpeak website. Download whatever Client version of the software corresponds to your operating system, and install it. It should be easy, so I won't go more in-depth. Now that is done, simply launch the software. Then, click on Connections and then Connect. It should now look like this. Fill out the correct IP address and your username. You don't have to fill out the rest. Once all the correct information is written, just click Connect. You will enter the server, probably in the Lobby channel. You cannot talk in it, so you will have to move elsewhere if you want to speak through your microphone. Make sure you read the rules written here and in the Lobby channel description so you don't break them mistakenly. If you want to keep the server in your bookmarks so you don't have to enter the IP every time you want to join, go to Bookmarks and select Add to Bookmarks. I recommend you to set it up like this. 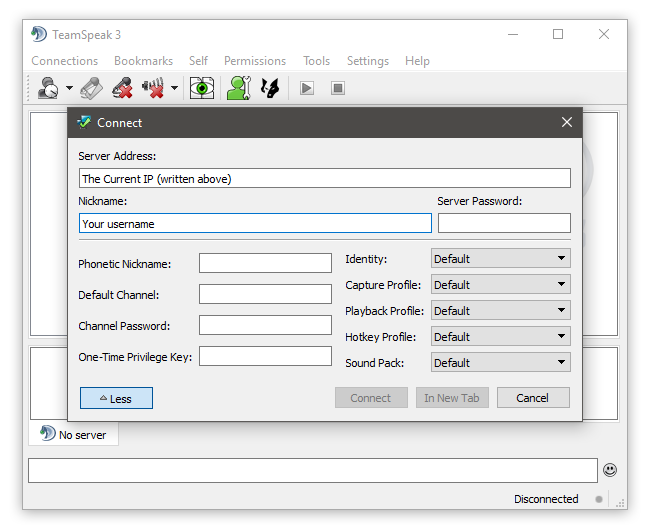 Connect on Startup means every time you launch TeamSpeak, it will directly connect you to the server you have this setting checked on. I use it, and I think it's pretty cool, so if you want this enabled as well, just check it. If you need to know more, post your question below, we'll answer!